Nuwave PIC 2 Induction Cooktop Review – Does it Really Work? If you’ve decided to have a look at this review on my website, the chances are you have seen the Nuwave commercial on television. Obviously, I couldn’t ignore the Nuwave PIC 2 either and just had to include their precision cooktop to my website. Moving away from traditional modes of cooking like standard electric or gas can be a decision that’s difficult to make, and Nuwave have tried to make it easier with this entry-level portable induction cooktop. They’ve really managed to get the message across. The good thing about this model is it’s a great starting point for those who are new to the world of induction cooking, because you get all the necessary cookware. However, as with any appliance you buy, there are pros and cons. That said, you’re not about to read a review that is an extension of their infomercial, but I will start with the pros for this cooktop before I touch on the negatives. Temperature control is something that’s highly important to any cook, and Nuwave has done a great job. You can choose from 100 – 575 Fahrenheit, and this will move up in 10 degree implements. This gives you a whopping 52 settings! And not just that, but you can pre-program up to 6 different settings which makes cooking your favorite dishes a breeze. The controls are push button with LED displays, and are located conveniently at the front. Just press the appropriate button and you’re away. 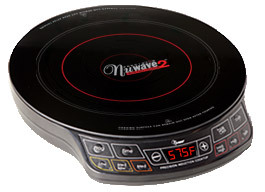 Unlike many other single burner cook tops, Nuwave has opted for a circular design. This way it doesn’t take up excess space where no cooking takes place, and it also means it’s easier to use at your dinner table (imagine replacing a warming plate with this instead. At breakfast, the whole family can enjoy watching and getting involved with cooking bacon and eggs, or at dinner you can chat while keeping an eye on your stir-fry. After all, mealtimes are about family). This cooktop is safe! And, that’s highly important when you’re using it in close proximity to other people (such as the dinner table). If you remove the pan from the burner, the unit will automatically shut off. You also have the benefit of a delay function which means you cook on your own schedule, and the unit will also shut-off automatically once a program has been completed. This one isn’t specific to the Nuwave PIC 2, but I have to repeat this because it’s an important thing you have to consider when turning to induction cooking. 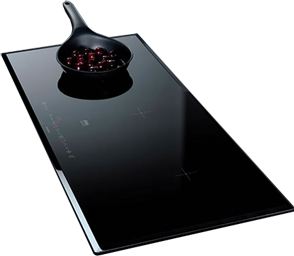 Induction cooking is up to 70% more efficient than using gas or traditional electric. This is because induction heating doesn’t send heat out into the air, or other parts of the unit. It simply heats in the cookware you’re using. Nuwave may have taken safety a little too far with this cooktop because when you remove the pan, it will shut-off (as mentioned above). This is a good thing, but if you’re the type of cook that likes to show off your “flipping” skills at the breakfast table, you will have to manually switch the heat back on each time. While the circular design does offers space advantages, there’s also the downside that it might not fit all your cookware. For instance, if you’re currently using square steak pans, you won’t be able to use them with the Nuwave. I’ve seen a few complaints about Nuwave’s customer service (or the lack of it..), and mixed reviews on reliability. To me, these are two very important aspects when buying online. To be fair, I’ve also read a lot of good things about the product and the support you get, and the customer reviews here on Amazon were also positive (for the most part), so maybe I’m just being overly sensitive. This cooktop is a great way to test out induction cooking techniques, in fact it’s my #1 choice for those of you who are dipping your toes in induction water. That’s because, first and foremost, you get a decent quality stove top with plenty of settings and safety features, but also because it’s relatively cheap. In fact, if you buy it from Amazon you can choose between 20 – 30 merchants who sell it for less than Nuwave does on their own website!